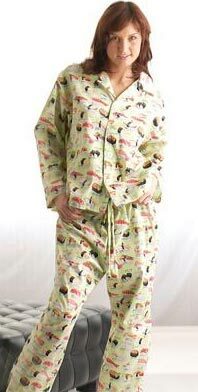 Sushi pajamas now on sale at Bare Necessities. Free Standard Shipping on U.S. orders over $75. No coupon code needed. Expires 1/6/2005. Note to "Buffy the Vampire Slayer" and "Will & Grace" fans: yes, these are the "yummy sushi pajamas" worn by Buffy and Grace! Feel like wearing sushi tonight? These cotton woven pajamas have full-length sleeves, a notch collar and white buttons down the center. The pants are full length with a drawstring elastic waist for a perfect fit. Now you can play "name that sushi" in bed by looking at all of the sushi (and their names) printed all over your pajamas! Buy now at Bare Necessities. Why Shop at Bare Necessities? With 35 years of intimate apparel retailing, we have carefully developed our online store to address the challenges and frustrations of intimate apparel shopping. We believe that our experience has given us insights into what our customers are looking for: selection, convenience and service, in a secure and tasteful shopping environment. We take great pride in providing you with high quality and value. If you are dissatisfied with a purchase, we will assist you with a prompt refund or exchange. Our 100% guarantee ensures that every item you purchase at Bare Necessities meets your standards. If it does not meet your expectations, you may return it within 60 days with original receipt and all merchandise tags attached for a replacement, exchange, or merchandise refund.